Do certain plants still trigger strong childhood memories when you garden with them every day? Pam/Digging asked this question in response to a comment I left on a post she wrote about her childhood garden. Though the plants I have in my garden are familiar to me, since I've known them all my life, several of them always remind me of my childhood. 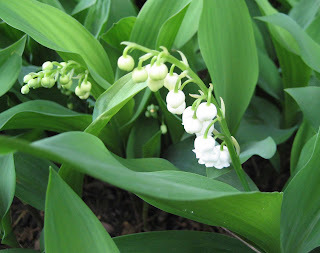 When the lily of the valley (Convallaria majalis) blooms, I recall sunny Sunday afternoons visiting my grandmother. She had a colony of lily of the valley by the side of her house, and when they bloomed we always picked bouquets of them. Even the smallest child can easily pick these flowers, and we picked lots of them. Grandma always seemed pleased when we presented them to her and would set them in vases on her dining room table. Occasionally, we would also pick violets at the same time, to create a mixed bouquet like this one. Now that's a bouquet from my childhood, and I like to enjoy one like it every year. 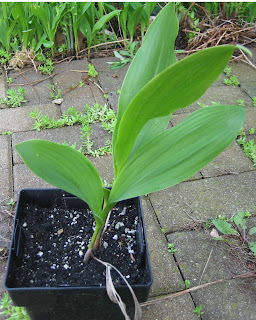 I have two colonies of lily of the valley in my own garden, started from plants I got from one of my sisters. But when I went to my aunt's house last spring to see her garden, I dug up one of her lily of the valley, even though I already had plenty, because hers came from my grandmother. I potted it up and overwintered it, and now I need to give it a home. But I don't want to put it with the other lily of the valley. I want to put it in its own spot, so I'll always know which one came from my grandmother's garden. I just need more shade. I have two colonies of white lily-of-the-valley, and one of pink. The pink ones I got on eBay, and the white ones all started with some that my aunt gave me several years ago. Interesting, that we have that in common! My nostalgic plant is the hollyhock. Mine came from seeds from my grandma's and I can remember hers from my childhood. I have some hosta from my Grandmother's yard, and have divided and shared them with many family members. The plants that I most remember from her home are False Indigo, the old fashioned Spirea, the big flowered Hydrangea, and Rhubarb, all of which I have in my garden. Carol, I enjoyed reading your response to my question. Perhaps it was the physical act of having picked those lilies of the valley---and your grandmother's generous acceptance of them (rather than a scolding)---that gave them such a special place in your memory. How wonderful that you have some of her flowers in your own garden now. Carol, I have to say that's a nostalgia one for me too. But not because it reminds me of my grandmother's garden. I'm thinking high school when we all wore Muguet des Bois perfume. The hallways sure smelled good! I'm glad you're giving your new plant a special place, it deserves it. My lily-of-the-valley overstep their beds and into the grass. 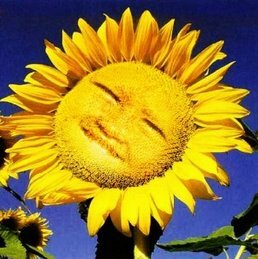 I give them their head till they're done blooming and then I mow them down. By that time they've given me many a bedside tiny bouquet! Yes, Carol, why didn't you get a start for us? I would love to have some in my yard. Remember the snowball bush with the ants crawling all over the flowers? I really love that second photo. Very elegant. Very simple. I love that kind of arraingement. Isn't it amazing that so many of us have the same childhood memories of picking lily of the valley and violets to hand to our grandmothers !? The spring is not complete if I don't have at least one bouquet of these flowers in the house. Mine are just emerging but I think I will see flowers by next week as it is getting warmer by the day. Thanks, I can smell them from here! 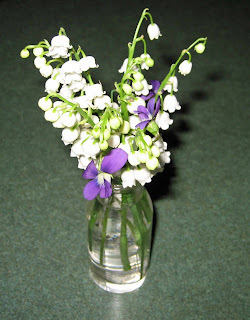 Lily of the Valley and Violets. Lovely. Have you seen pink Lily of the Valley? We had some for a while. A gift from an old store customer. But I think they sort of faded out to white. Might still be some pink there. 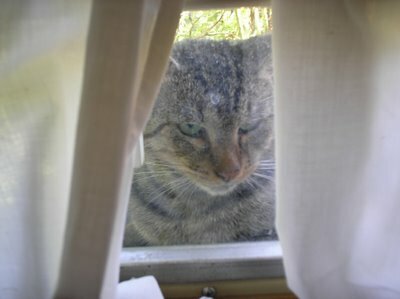 I must look carefully, when they come up. I think my favorite memory is from the peoni bushes that dad had on the south side of the house. I remember every spring taking those flowers in to our teachers. Lilly of the valley makes me think of France. Today is May Day and when I lived there you can buy them on the streets and give them to people. I forget what the reason was for, but the house we bought has them and I LOVE picking them and bringing them in the house. They always make me smile. Thanks for sharing your story! I always pick a tiny bouquet of lily of the valley. Mine I got from a dear friend. My nostalgic plants are white roses (from my paternal grandmother), Peony from my childhood garden and wild meadow flowers. Well, my dream garden is a lot lily of the valley, but i actually cant grow it plant successfully.